The trip to Cebu would not be complete without taking new photos of Mactan Airport’s departure lounge. This was already expanded and improved a few years ago to accommodate the steady increase in the number of visitors to Cebu. It will soon be part of a major project to expand and upgrade the airport so perhaps this year will see the start of a transformation of sorts for the airport. Following are a few photos describing the departure area. A crowded departure lounge greets travelers upon completing the final security check. The boxes at the right and near the garbage bins are containers for items prohibited from being hand carried to the aircraft. Passengers tend to congregate near the eateries and shops even if their gates were a few minutes walk away. Eateries and other concessionaires at the airport departure lounge include those offering Cebu lechon, dimsum, donuts, sandwiches and others. There’s a small screen showing the status of flights. I think the airport should eventually have a bigger screen for such useful information. The District Emporium specializes on locally made stuff including bags, accessories, crafts, footwear and other interesting items travelers can take home as souvenirs. List of Cebu Pacific flights boarding at our gate and the one near it. These many flights meant a very crowded waiting area. You can see from the photo passengers standing and seated on the floor as they wait for their planes to arrive and be called for boarding. 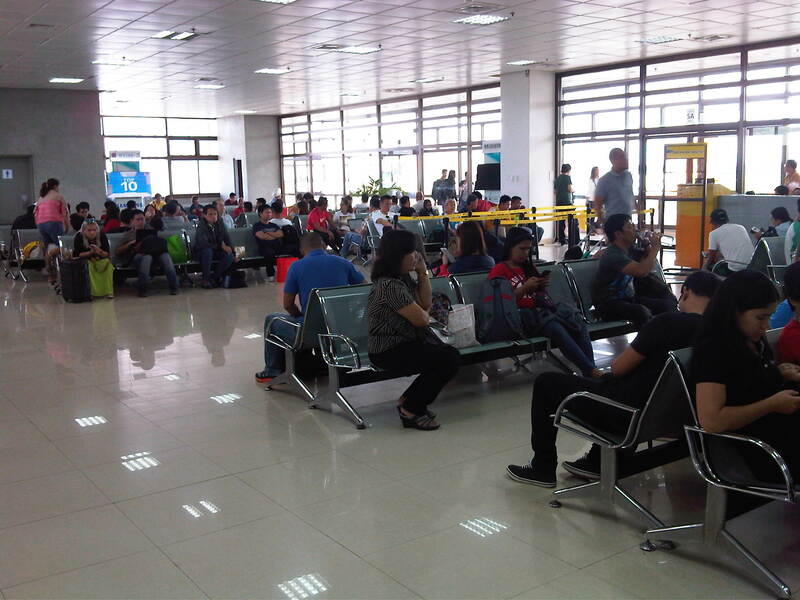 Inside the departure area that was apparently all for CebPac flights, many seats are actually unoccupied by people. Many seats have bags or other stuff on them care of passengers who tend to hog seats for themselves. Another look at the area for departing passengers. I expect to be in Cebu at least one more time this year. We have a big conference coming up in September for the Eastern Asia Society for Transportation Studies. This is a biannual international conference that is hosted by different Asian cities and which the Philippines will be hosting for a second time (The first conference was held in Manila in 1995.). We’ll see if there is a drastic change by then as the airport project is one that is tentatively listed as part of the technical tours for the conference. By d0ctrine in Airports on February 1, 2015 . What needs to change? .. at dapat pasikatin? A souvenir shop in Cebu. DISTRICT EMPORIUM – A branch of New Datche Phils Traders Corp. inside the airport.